The Electricity of Vietnam (EVN) should continue promoting its key role as a State-run company in national power supply, Prime Minister Nguyen Xuan Phuc said at a conference in Hanoi on January 3. Towards that goal, the group needs to ensure the progress of current power projects, while carrying out new ones and working on projects to develop renewable energy. It should work out mechanisms to encourage all economic sectors to produce electricity and fine-tune financial mechanisms, the PM said. The PM asked the group to push ahead with restructuring to improve its operational efficiency and competitive edge as well as complete the equitisation of its three power generation corporations in 2017-2018. EVN will keep operating six strategic, multi-target plants and relevant ones, whilst equitising the retail and service sections, he directed. The Government leader requested EVN strengthen management, especially financial administration, to prevent corruption in the equitisation and investment stages. He reminded the group to focus on environmental protection and not simply produce electricity at all costs. 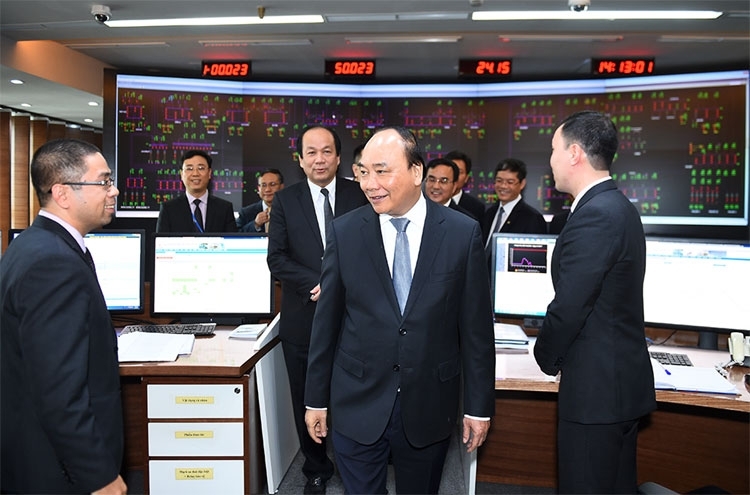 Regarding the nuclear power project in the central province of Ninh Thuan, PM Phuc ordered EVN to arrange the project’s human resources appropriately and utilise infrastructure effectively to make up the shortfall of electricity due to the project’s halt. He pointed to shortcomings such as uneven distribution of electricity in the southern region, economic losses of some fundamental construction projects, and several projects harming local people’s living environment. A shortage of electricity in the middle and long term is likely to occur, he worried, adding that the EVN should work out measures to meet the country’s development targets such as economic growth of 6.5%-7%, one million businesses by 2020, and an export surge of 8%-10%. EVN needs to step up administrative reform and directly help the country enter the leading group of competitiveness in ASEAN, he said, noting that Vietnam is ranked sixth in ASEAN in the index of electricity access. In 2016, EVN generated and purchased 176.99 billion kWh of electricity, a yearly increase of 10.8%. Commercial electricity reached 159.45 billion kWh, a year-on-year rise of 11%, surpassing the annual target by 350 million kWh. The group coordinated with the irrigation sector to provide over 3 billion cubic meters of water for the 2015-2016 winter-spring crops in the northern delta while ensuring sufficient water for drought-hit areas in the central and Central Highland regions. At the end of 2016, 73 power plants joined the power market, generating 17,929 MW of electricity. The EVN fetched over VND264.6 trillion (US$13 billion plus) in revenue last year, up 12.9% against 2015. The group also put into operation the Lai Chau hydropower project in the northern province of Lai Chau in 2016, one year earlier than scheduled, saving VND5 trillion and ensuring electricity for flood-hit localities.